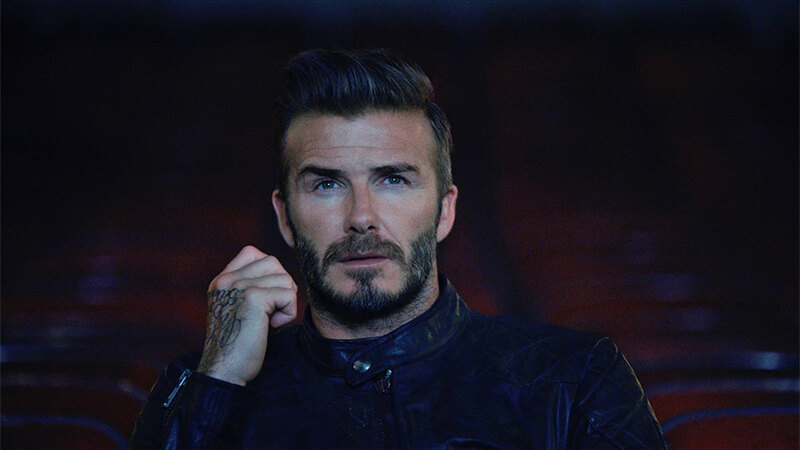 Brit clothing brand Belstaff partnered with LEGS director Geremy Jasper to bring us "Outlaws," a lush 15-minute epic for the Web featuring David Beckham, Katherine Waterston, Cathy Moriarty and Harvey Keitel. Richly produced, the tragic and surrealist romance mixes Spanish and English, black-and-white with color, 1950s Mexico with a modern-day lone wolf (Beckham), and circus performers with biker gangs. Beckham, whom Jasper says was involved from the beginning, stars as our Mysterious Drifter. Haunted by the readings of a blind Tarot card reader, he motors across the desert as a gang of bounty hunters gives chase. He eventually finds himself in an all-night cinema, which is playing a Fellini-style film about a beautiful trapeze artist (Waterson). 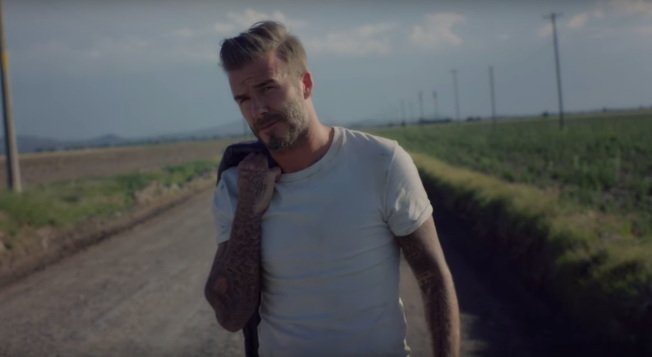 In a surrealist twist, Beckham discovers he is also in the film, as her love interest and savior. 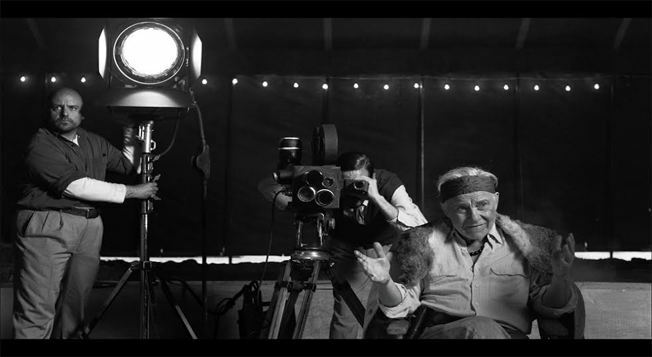 Art follows reality: The two end up on the run, with the megalomaniacal circus master (Keitel) sending bikers after them, wedding the movie's end to this short film's beginning. "Harvey … goddamn," Jasper says of Keitel's involvement. "I couldn't believe it. He was interested in the world I was trying to create and could not have been more of a mentor for me. To collaborate with someone like Harvey Keitel, who is a true blue hero, is something I can't put into words." Before the credits roll, our hero briefly reunites with his love interest—sans sad-clown makeup—in the real world. She is modernized and, judging by the jut of her jaw and sassy new lipstick, life-hardened. The conclusion shouldn't come as a surprise for those who know the genre. Or you can take a cue from the narrator: "The Outlaw knows no home. He haunts the highways like a Leather Ghost. Waiting for her to return. In vain." "I was knocked out by Katherine Waterston's performance in Inherent Vice and had to get her for the trapeze artist," said Jasper. "We got lucky because she responded to the whole vision." The film is packed with winks to a diversity of influences: Gritty, drama-saturated old Westerns, La Strada by Fellini, and, of course, Freaks by Tod Browning. 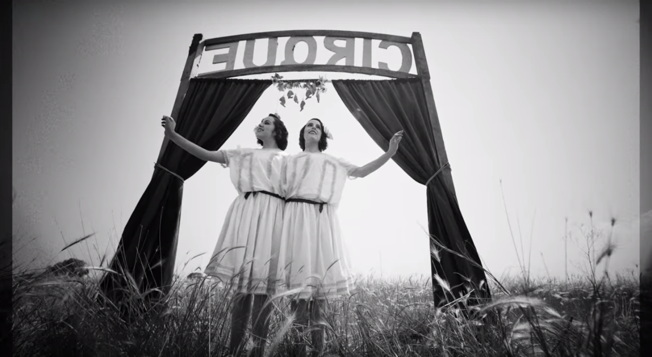 If you're an American Horror Story fan, the Freak Show season will resonate especially; its vibe has that same sinister, old-meets-new approach to the enigmatic world of traveling circuses. 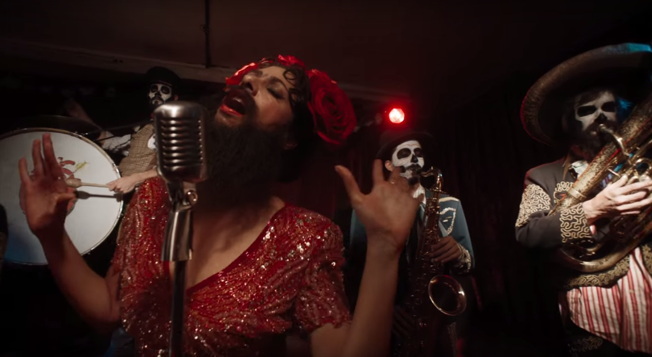 And we're pretty sure Conchita Wurst inspired the lounge singer (shown below). They've got that same sultry sadness going on—complete with beard! "For me, it's a very personal film, and I've been waiting more than a decade to be able to tell this kind of story with this kind of visual style," Jasper says. "Belstaff were looking to make a short film starring David, and they loved the story, so they joined forces with LEGS and supported me wholeheartedly in what I wanted to do creatively." LEGS co-founder Adam Joseph—who also serves as managing director and executive producer for "Outlaws"—added: "Across everything LEGS does, there's a consistent combination of the classic and the avant-garde at play that keeps pushing us all forward." Check out "Outlaws" below. It's also featured on Belstaff's website, where the brand is offering behind-the-scenes glimpses of the film premiere, and the chance to win one of three signed leather jackets worn in the film.